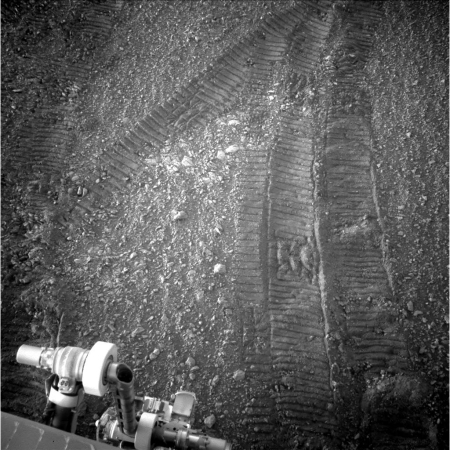 Summary: Curiosity ascends up steepest part of Vera Rubin Ridge, getting just below the ridgetop, while Opportunity inspects its footprint in Perseverance Valley. Since my last update on August 11, Curiosity has been slowly working its way along the base of Vera Rubin Ridge, and up its slope. Today’s update from the science team describes how the rover is now on the steepest part of that slope, which is also just below the ridgetop. The panorama above looks east at the ridge, at the sand-duned foothills in the Murray Formation that Curiosity has been traversing since March 2016, and the crater plains beyond. Curiosity now has great, unobstructed views across the lowlands of Gale crater to the rear of the rover. The view is improving as the air becomes clearer heading into the colder seasons. The first image link below shows a Navcam view into the distance past a cliff face just to the left of the rover. The image is tilted due to the to the unusually high 15.5 degree tilt of the rover as it climbs the ridge. Part of Mount Sharp is in the background. 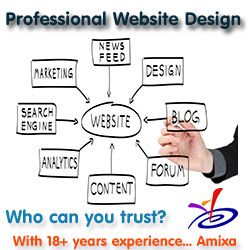 The second link shows an image looking ahead, where we see much more rock and less soil. The foreground shows that some of the pebbles are relatively well rounded. The rock face up ahead is smooth, which will mean easier driving. That report I think is somewhat optimistic. If you look at the image at the update of the upcoming Hematite surface, it shows a never-ending platform of rocks that I think is going to continue to chew into Curiosity’s wheels. 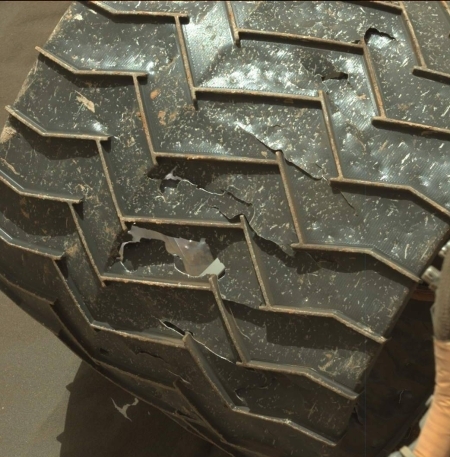 The image on the right is a close-up of one of a series of images taken of the rover’s wheels on sol 1798, and gives a sense of their present condition. The importance of this is that the journey up Mt Sharp has really only just begun. Furthermore, there are several intermittent water seeps that they hope to take a close look at in the near future. I pray that those wheels hold out for many more years, as it is going to take that long to reach the truly higher elevations. It is quite possible that the ground will smooth out somewhat once they climb up off the slope and onto the plateau above. Let us hope so. Because of the coming of winter and the limited available sunlight to recharge Opportunity’s batteries, the rover has not traveled much since my August 11 update. The rover has essentially done very short moves in Perseverance Valley, each placing the Opportunity on a location that will give it maximum sunlight. Even so, they are using these short moves to study the surface of the valley to try to determine if it was formed by water, water ice, or wind. 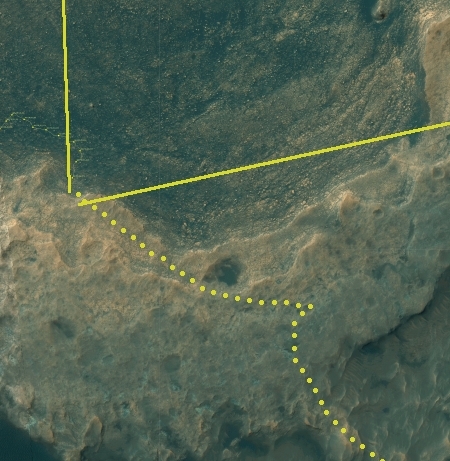 The image to the right was one of several taken of the rover’s tracks in that valley. This will tell scientists the depth of the dust, and help them determine what shaped its flowlike pattern, as seen from orbit. Because of the coming of winter, we shall not see much activity from Opportunity in the coming months. Unlike Curiosity, which is powered by a nuclear power-pack, Opportunity depends on solar power, and the amount of sunlight it will get during the winter will limit its operations. Still, the rover has survived a half dozen or so such winters already (none of which were ever planned), so we should expect it to survive this one as well.